Are you in charge of feeding a large gathering of people at your workplace, family gathering, or school function? Do you love to host birthday parties or reunions but hate to stress about the food? 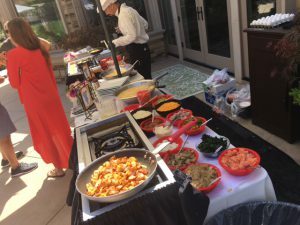 At Mr. Omelette Caterers, we take the weight off your shoulders and make sure that everyone leaves with a full stomach and a smile on their face. We have several options to satisfy even the pickiest palate. Located in Vienna, Maryland, we also do business in Salem, Mardela Springs, and Rhodelsdale, so don’t hesitate to contact us for an appointment. For business and corporate gatherings, our Vienna breakfast catering has several packages that you can choose from. Each comes with an egg dish, such as an omelette (with a generous selection of add-in and toppings), fresh muffins, bagels, breads, and beverages such as orange juice and coffee. Both stations provide fresh fruit including grapes, watermelon, cantaloupe, and kiwi. After your plate is full, fill up on orange juice or coffee. If you want something different, just pick the fruit and we’ll mix it for you! Our blog provides a wealth of information if you need new ideas for the kitchen, or for a holiday party you are planning. We know our way around the kitchen and might have a few tips that you haven’t heard about. We can also let you know about our current specials or if there is anything new in our selection. Our Vienna breakfast catering has been around for 25 years and we love bringing people together with food and drink. 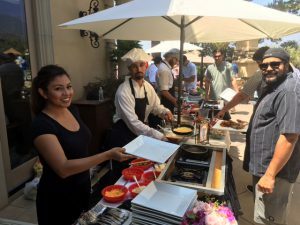 We are a family owned catering business and are here to make the most of your next get together. Give us a call or fill out our form on our website with your number and questions and we’ll get back to you shortly. We can work with any size of group and appetite. 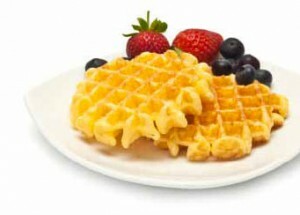 From our large selection of breakfast foods, your business or family gathering will be a complete success.